I’m Smriti Somasundaram and I am an 8th grader at Tumwater Middle School and the Washington State Chapter Lead for ThinkSTEAM. 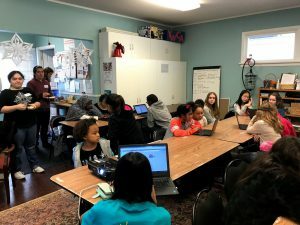 On December 20th, I held my first ThinkSTEAM workshop in Washington in partnership with YWCA, where I taught Scratch programming to middle school girls. Scratch is a type of programming language for kids that challenges them to use their imagination to create games, stories, and animations. 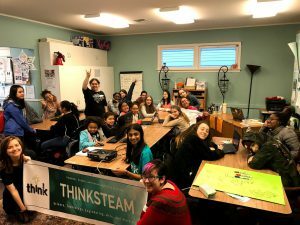 I started the West Coast ThinkSTEAM chapter with a Scratch workshop because I thought it would be a great way to introduce girls to the idea of coding. I first got involved with ThinkSTEAM in 6th grade, when I won their ThinkBIG challenge. The following year I started helping other girls develop their skills in coding as I was noticed by the founder of ThinkSTEAM. I was stoked to see this new relationship arise and found more resources when helping more girls. Now, I have a leadership role in the organization as the Washington state Chapter Lead. I hope to grow the involvement of girls within STEAM fields by presenting opportunities for girls to develop their knowledge. We decided to partner with YWCA because they had the most similar goals as ThinkSTEAM. The projects they did helped changed the way women think and the new careers they chose for themselves. We started our first workshop with Scratch, as it is the most basic form of programming that will give girls the foundation they need to pursue future endeavors in coding and STEAM. We started the workshop by going over the basic blocks of scratch programming and then coding a step-by-step ping pong game. We had more than 15 girls in attendance. I knew the amount of girls showing up might be little for the 1stworkshop, but I was surprised and excited to see these many girls in our area willing to give coding a try. These young women came from a variety of Scratch backgrounds, from some already having a bit of knowledge to others taking it on for the first time. Nevertheless, these girls learned very quickly and have progressed on their paths to becoming STEM experts in the near future. In this workshop, I loved seeing the variety of designs when the girls learned how to make the ping pong game. More girls should get involved with STEAM because out of all the software developers, only 20% are women. “In London, out of 386 public works of art, only 8% was created by women” (The Guardian). “Only 7% of partners at top 100 venture capital firms are women” (Techcrunch). We need to bridge the gender gap in all of these fields. I would like to thank Washington STEM for helping us start our first workshop by connecting us with the Capital STEAM Network director, Wes Pruitt, who in turn helped us partner with YWCA.